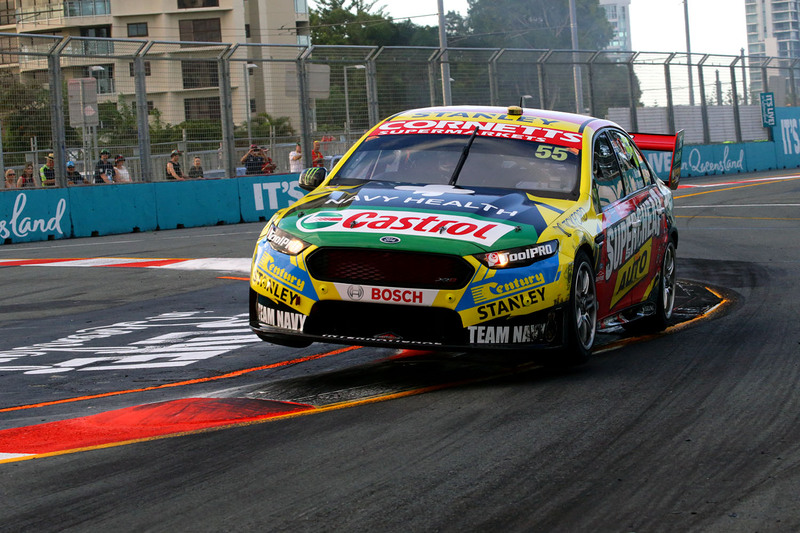 Chaz Mostert and James Moffat have won Race 26 at the Vodafone Gold Coast 600 as Scott McLaughlin took over the Virgin Australia Supercars Championship lead. The race fell to Tickford’s Supercheap Auto Racing entry after Fabian Coulthard and Tony D’Alberto were effectively sacrificed to help McLaughlin’s title hopes during a stacking pit stop. Moffat was handed the lead by D’Alberto, who was on heavy fuel saving, with 66 laps remaining and the #55 FGX Falcon was in control from that point onwards. Craig Lowndes and Steven Richards (#888 Autobarn ZB Commodore) finished second from 21st on the grid thanks in part to the kind timing of the race’s only Safety Car. James Courtney got home on fumes to deliver a podium for he and Jack Perkins in the #25 Boost Mobile ZB Commodore, ahead of David Reynolds/Luke Youlden and Scott McLaughlin/Alexandre Premat. Shane van Gisbergen clawed his way back to 10th after a drive-through penalty for an unsafe pit release while Earl Bamber was in the #97 Red Bull HRT ZB Commodore. Premat showed a clean pair of heels from Armor All Pole Position and led Paul Dumbrell, Tony D’Alberto, Moffat, and Youlden away, the latter of whom lost a position due to a tardy start. The complexion of the race first changed just two laps in when Dumbrell showed the nose at Premat and tagged Car #17 at Turn 12, which saw the Shell V-Power FGX Falcon bounce off the tyre wall and drop to fifth position. They pressed on as race control advised of no further action and the only other serious action for the next 20 laps was Lowndes, the only starting primary driver, cutting a swathe from 21st on the grid to eighth position. A Safety Car called on Lap 23 triggered major drama in the pits and drive-through penalties for both of the Red Bull Holdens. All of the field, except Dean Fiore (#23 Industrial Athlete Nissan Altima) initially, filed into pit lane but Dumbrell stalled and entered the fast lane right in front of Moffat, who could only run into the #1 ZB Commodore. Car #97 was also sanctioned for an unsafe release after it forced Garry Jacobson (#15 Castrol Nissan Altima) to brake to avoid contact. DJR Team Penske was far slicker, short-filling the #12 FGX Falcon in a perfectly timed pit stop which saved having to stack Premat. The Safety Car was necessitated when Will Brown smacked the outside wall exiting the Front Chicane in Anton De Pasquale’s #99 Erebus Penrite ZB Commodore. Several missed him but Steve Owen tried to drive through a gap between #99 and the wall which wasn’t quite as wide as the #56 Rabble.Club FGX Falcon and sheared a wheel off the stricken Holden. D’Alberto led Moffat, Dumbrell, Youlden, Premat, and Richards after the pit stops, while Perkins was ninth and Bamber 11th due to the stack. Cars #1 and #97 took their PLPs shortly after the Lap 28 restart and both dropped outside the top 20. The timing of the Safety Car locked most co-drivers into an unusually long shift, and D’Alberto let Moffat pass easily at the start of Lap 37 as he was forced to conserve fuel. Premat made one attempt to pass the third-placed #9 Erebus ZB Commodore at the Hairpin on Lap 59 before being gifted the spot four laps later when Youlden locked the rear brakes. Between that time, D’Alberto pitted around five laps short of the accepted critical lap, while the two Walkinshaw Andretti United cars and the #33 Wilson Security ZB Commodore also pitted within the next two laps. The rest of the field took their respective final pit stops on Laps 60 to 63, all changing to primary drivers, leaving Mostert in the lead from Courtney, Lowndes, and Reynolds. McLaughlin was fifth having lost track position due to Richards’ fuel saving in #888, while Fabian Coulthard was 10th, Whincup 16th, and van Gisbergen 19th. Lowndes caught the fuel-saving Courtney with a little over 20 laps remaining and stalked him until he drove past on the run to the Beach Chicane on Lap 97. By then, Reynolds had closed in but he couldn’t manage to pass Car #25 and finished fourth, while McLaughlin had a lonely run to fifth. Sixth through ninth were Nick Percat/Macauley Jones (#8 Alliance Truck Parts ZB Commodore), Mark Winterbottom/Dean Canto (#5 The Bottle-O FGX Falcon), Cameron Waters/David Russell (#6 Monster Energy FGX Falcon), and Garth Tander/Chris Pither (#33). Coulthard also managed to get home on a long final stint but that meant he had no fuel left to try and smother van Gisbergen’s charge home as Car #12 finished 11th. Whincup, who made life easy when his team-mate van Gisbergen came up behind, finished 14th in the end. Rick Kelly was 22nd, four laps down, having apparently broken the steering of Car #15 through the Beach Chicane while under pressure from van Gisbergen late in the race. The win for Mostert and Moffat was team and primary driver’s first since the corresponding race of 2017, and the latter’s second in his Supercars Championship career. “(Moffat) drove the wheels off it and gave it back in a good position,” said Mostert. “(I) Just tried to manage the gap and look after the car. Moffat added, “I’m just lucky to drive this car with Chaz, he’s an absolute animal, massive talent, so I thank him for bringing me along for the ride. Courtney, meanwhile, still had enough fuel to drive into parc ferme. “The fuel alarm came on just as I went into the pit lane,” he advised. “Our thing is amazing on economy and the boys in the engine shop have done an amazing job. McLaughlin turned a 19-point deficit into a 14-point lead over van Gisbergen in the championship as Lowndes/Richards extended their Pirtek Enduro Cup lead. The field is next on track for Armor All Qualifying for Race 27 tomorrow at 1020 local time/1120 AEDT.